Featured Blog #19: Our featured blog, The Chronicles of Love Mindanao is the FBW Top Travel Blog of 2012, beating out 42 other nominees. Every blog post is a great way to share the author's travel experiences and inspiring images to his readers. The pictures alone are worth more than a thousand words, while the story behind the pictures are just as fascinating to the readers. Let us learn more about the author of the Love Mindanao who inspires more people to travel not only to Mindanao but around the Philippines as well. Blog Description: The blog site started as a personal advocacy to overturn the general public’s negative impression about Mindanao by promoting its rarely seen and unsung paradise hidden in the most deprived Christian and Muslim communities in the Philippines. About the blogger/Tell us something random about yourself. I hate the limelight the same way I hate sitaw (string beans). I turned down several offers to work abroad and decided to put my degree in practice as environmental specialist in Mindanao and ended up very very poor. I love the perceived ugliest living creatures either plants or animals. Keeping in touch with wild birds and snakes and any carnivorous plants seen in the forest keeps me alive. A beach lover, but never lasts in the water for more than five minutes. I was so lonely working in the most secluded community with the most beautiful preserved natural environment in Surigao del Sur. There are no other means of entertainment other than rowing a boat to the river and singing in a cheap videoke bar. So, with nothing much to do, I hit the net and activated my blogger account and started sharing my unique travel experiences purposely as an advocacy for uplifting the negative impression about Mindanao. What do you find to be your biggest struggle as a blogger? Communication. It sounded so odd, but, I am really having a hard time to convey what I really wanted to tell to my readers. Since my blog is a form of an advocacy, I wanted to make them feel what I actually felt in a particular place, people or culture I am featuring. I am not a professional writer and the only reason I am able to write is when I am deeply inspired emotionally and things just flow naturally. It started just last June 2012 when I got myself hooked into sharing my travel experiences through blog. But what really inspired me to write was when I saw the Manobo Children of Inadan of San Miguel Surigao del Sur, who live in the most serene and beautiful mountain place, but left with little hope to finish their education due to extreme poverty. It was an ironic situation that the place is rich with beautiful natural resources yet the community dwells deep into poverty. And with nothing else to do during that night I wrote everything I can remember especially my encounters with the indigenous community, hoping someone would pick it up and start to trigger a fire of hope for these people. So far, my favorite blog post would be my Tawi Tawi Series. It changed everything about my perception about our Muslim brothers and sisters and the whole ARMM and the freedom they are fighting for. Learning it first hand with the people of Tawi Tawi is far different from what is being shown in the media. I have seen the truth, the sincerity and hospitality of the original dwellers of Mindanao. My jaunt in this part of the country is a ‘nirvana’ to which I could really vouch for all Filipinos that just like anybody else, the people of Mindanao only seek peace and want to live in prosperity. For me it is the happiest place where I experienced true freedom away from the norms of our current society. I could just walk on the roads of almost 100% friendly Muslim populated barangays and some are even “kikay”. I can even wander alone in the farthest country side and run and lie down in their deserted airport’s airstrip- unharmed! I am not aiming my blog to become a household name in the future but hoping it serves as a reference and triggers our fellow Filipinos and even the outsiders to extend their assistance to our brothers and sisters in Mindanao instead of avoiding them. I just hope that my message be received by everyone about the unspoken truth. It maybe not in my lifetime but still my hope flares high that my advocacy will have its fruit in due time. I’d like to set this blog as an inspiration, saying that I can do more and be a productive citizen of my country. So, if I can do blogging and it inspires others, it means I can also do other things beyond my limitation in the coming years. We just have to wait and see what the future have prepared for us. Financially, I am not going to depend on it. But this platform introduced me to a wider audience that enhanced my personality to be more open. Blogging is like a diesel fuel which slowly triggers to develop my personality positively and continues pushing me off to my limits. I have now a wider audience that connects to my passion and giving more inspiration to continue on what I am doing right now. Blogging may have brought me a checkered life and career but at least I don’t adhere to the expensive norms of our society. Carpe diem! Blogging involves writing and I would like to quote “Professional writers are amateurs that never quit!”- by anonymous. Consider this platform as a medium to share your aspiration in life and not merely a source of additional income. Write passionately and accept criticisms. Seek the advice of the seniors and always remember to connect to the heart of your readers and never fail to thank them as well. They are the bloodline of your blog’s existence. One of those travel blogs that offers outstanding info and great photos. A virtual online travel tour. I learn so many thing reading about Dennis blog about Mindanao and the interesting activities he does. Big respect to the author behind LoveMindanado! :) I've always been a fan of his blog, but I never actually knew how he started in this hobby. It's refreshing and very inspiring to know his purpose in blogging and I wish I can experience Mindanao and its beauty, people, culture, and of course food, first hand. When "The Chronicles of Love Mindanao" won the FBW Top Travel Blog last year, it was proof that many appreciate reading about the other side of Mindanao which centered on beauty, nature, peace, and all the good things that the place can offer. This blog feature is very much deserved. awesome feature and that's a great blog. i've never been in mindanao so ths will help in my future travel there. Love Mindanao is so interesting. Glad you featured it here. It's also good to know about the co-bloggers in a community. congrats LM- way to go! continue featuring amazing places in the land of promise. I met this guy once when we had a mini FBW meet here in Davao and it's such an honor to meet him. He's like the voice of every Mindanaoan and I'm glad that he tries to change the usual perception of Mindanao from a war-torn island into a paradise worth living. Through his blog, I've learned many things. From the most beautiful to the most extreme food. 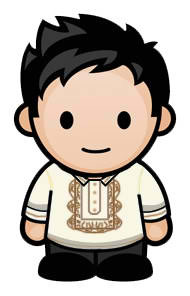 His blog is worth something that we can learn about Mindanao and what's behind this media stereotype about this island. As a Davaoeno and a Mindanaoan, I'm proud for him and may his blog live longer to widen the senses for those who want to learn more about Mindanao. I love reading LM's blog not only because of the photos but the stories behind those photos. I really do believe that the media portrayal of Mindanao is skewed towards its negative aspects more than the positive ones. Like in any place, there are good and bad traits that we should learn to accept and hopefully change. The author seems to love nature and loves to connect with the Mother Earth. Giving up some opportunities for the sake of her passion is really impressive. Love Mindanao is a great blog. Very informative. I actually just bookmarked the site for future reference to where to visit to Mindanao. I've been dying to travel there, but just can't get enough idea on where to go. Bravo for this feature. It's also good to know about the person behind an awesome blog. thank you for all those heart fattenning comment ...I hope i dont get a heart attack ..i thank you for all those words of appreciation . good luck to all of us . and bless us all. I have never been to LM till now, great site full of information! Now I have a go to website for travel infos for Mindanao. 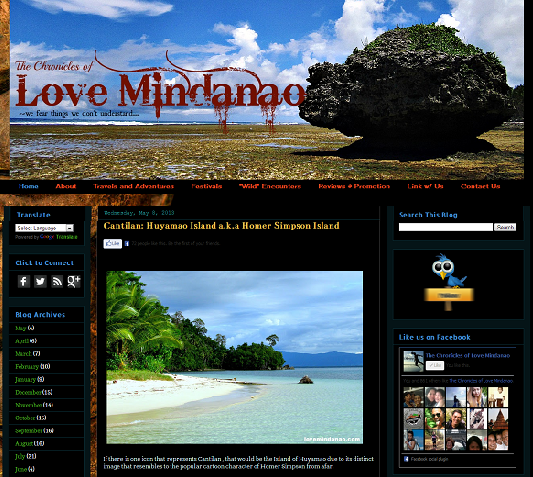 Love Mindanao is a very interesting blog and the owner, he's an energetic guy. Congrats Dencio. hehehehehe....na feature ka na talaga! Hehehehehe. Glad to know LM, I love reading his blog since then (yung di p ako blogger). Salamat sa FBW at nakita ko at nakausap ko sya in person. Love Mindanao is one of the best blogs out there. The author has given a fresh new perspective to the beauty of Mindanao. Great job buddy! write passionately and accept criticisms. that the best thing i've heard so far from blogging. which I believe so far. I enjoyed reading your blogposts as well its great to know that we're all discovering new and truthful things about this province and not just violence! Kudos to you love mindanao! I love the blog of lovemindanao - it is also nice to learn that it is part travel blog part advocacy about Mindanao. So that's how he got the name! :) I was born in Iligan City and lived my toddler years in Zamboanga so I am, in many ways, from Mindanao as well. I am immensely moved by what lovemindanao shares in this post. It's a great advocacy blog. I wished her all the best in all her endeavors. It is great to know another travel blog that features different places of Mindanao, the island where I come from. Thanks for sharing this blog. Another blog to read and know more about my island. That blog is a great resource for travel in Mindanao! really love reading this blog!! it's just showcases Mindanao to a whole new perspective!